Preheat oven to 350°F. Salt and pepper chicken strips. Cook strips in 2 tablespoons olive oil (approximately 2 minutes on each side) or until brown. They will finish cooking in the oven. Lay chicken strips quickly on a paper towel to remove excess oil and then lay them in a 9x13-inch baking dish. Mix juice of lemons, lemon zest, 2 additional tablespoons olive oil, thyme, basil, and onion salt until well blended. Pour this mixture over chicken strips. Sprinkle with feta cheese, and bake for 10 to 15 minutes. Chicken is very easy to over-bake and you can’t afford to be careless with oven temperatures or bake times. To ensure a juicier baked chicken, brine your chicken overnight in salt water (1 cup salt to 4 cups water). Coat your chicken pieces in either mayonnaise, buttermilk, undiluted cream of chicken soup, or dry Italian dressing mix before rolling them in your crusting ingredients. 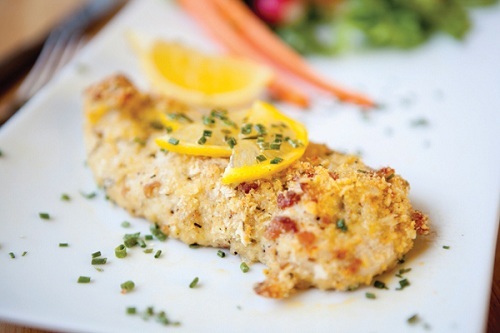 This Lemon Chicken with Feta recipe is from the The Ultimate Cook'n Cookbook Cookbook. Download this Cookbook today.